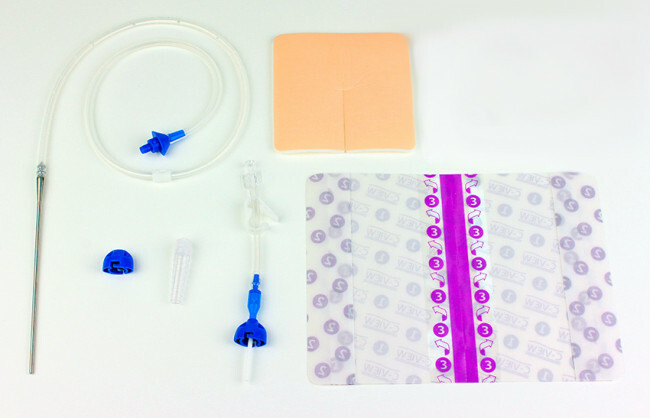 R54400-16-MI Rocket® IPC™ Post VATS Insertion Set is indicated for intermittent, long term drainage of symptomatic, recurrent, pleural effusion. Including malignant pleural effusions that do not respond to medical treatment of underlying disease. Soft, kink resistant material approved for long use, giving increased patient comfort. 16Fg x 40cm catheter with 24cm fenestrated section, large diameter holes to maximise drainage and reduce occlusion risk. Polyester cuff to promote rapid tissue in-growth, minimising infection risk and aiding catheter security. Simple, cost effectvie, long term treatment for pleural effusion.